We install solar and green power systems of all sizes. We accept large or small earth moving projects! ESS has extensive experience with large and small construction projects. The quality of the work we perform, and our integrity throughout every phase of the building or remodeling processes sets us apart. For rennovation, new construction, land clearing/build preparation, or solar and other green-power installations, we have the experience, expertise, integrity, and versatility to fulfill your needs. Full spectrum land clearing services: Forestry Mulching, Tree and Overgrowth Removal, Construction Site Clearing, etc. Emory Site Solutions built me a beautiful, high quality deck, and I'm super happy! With over 50 years of combined experience in the industry, Emory Site Solutions has mastered most aspects of the land clearing and construction fields. Our company was built from the ground up on principles that have proven to be efficient and able to withstand the test of time. 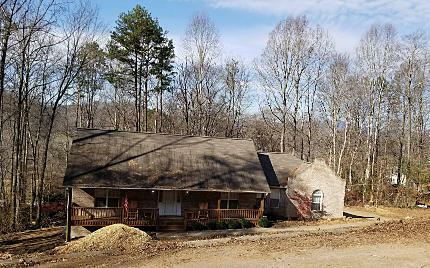 Emory Site Solutions is fully licensed and insured, and we serve customers in East Tennessee and the surrounding areas. 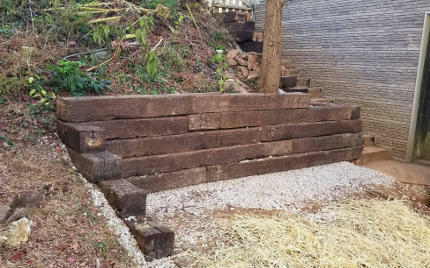 Recently we were commissioned to build a small retaining wall out of railroad ties to give the homeowoner more usable space beside her house. We cleared land around a house that had severe overgrowth. The project involved removing 41 trees. The end result is a visible home with plenty of light, no more gutter problems, and no danger of trees falling on the house during a storm.